In late June, while at our store, Nest Interiors, I could see something black on the ground in our parking lot. Upon closer inspection...a chimney swift! Alive, with a few mites around it's eyes, it just couldn't seem to get much lift off. My spouse and I put it in a small box with a towel over it to calm down. While it was resting, I googled everything about Chimney Swifts. Many of them are injured by being removed from chimneys; as cliff dwellers, their claws and even toes can be ripped off in the process. Horrified, I went to the bird, gloves on, and gently turned it over...feet ok. Whew. What a relief. The next common issue was dehydration and it had been very dry. But the little that I knew, I knew them to be a special insectivore; i.e. they eat bugs and receive both food and water from this. So I knew not to offer any sustenance, plus I am not a licensed bird rehabilitator. I quickly came up with a short term and long term plan. Short term, let the bird rest (it was not in distress, not bleeding, no visible injuries) then attempt to release in a few hours before sunset. Long term plan, contact the closest rehab (I already had this info researched before Spring) and deliver the bird as soon as possible. Unfortunately, the bird was still not able to fly in the evening, so we packed it up and brought it home for the night. The long term plan required a 2 hour round trip and it had to wait until morning because of our own little 3yo nestlings. I felt cautiously confident, as this cutie was so alert. We tucked the small box inside one of our large butterfly netted tents and kept it in a quiet room. 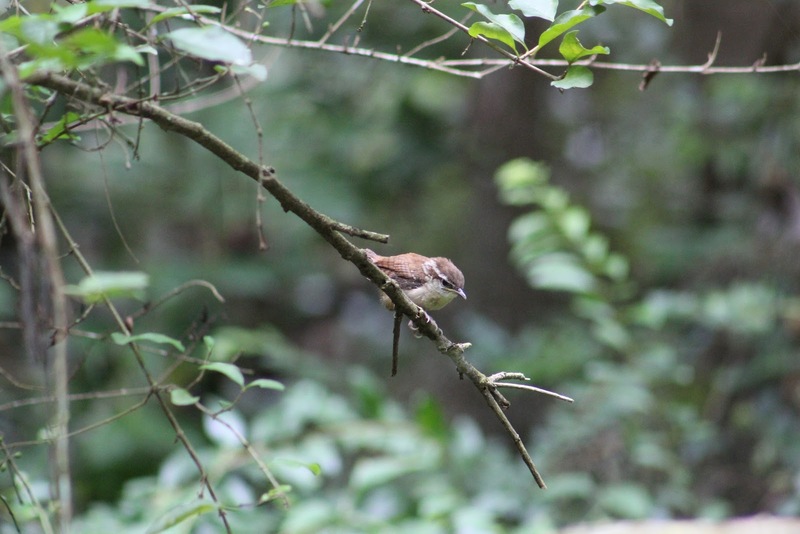 The transfer to LSU Wildlife Rehab Center went off seamlessly and though we did not get a follow up with how our bird fared, we knew it was in the best hands. A week ago, we had yet another challenge. This time our Husky grabbed a Carolina Wren nest that we had secretly been made in a flower pot on the ground. I knew she had something as she did the shake-shake with her head. As I got closer and I saw all the woven leaf debris, my heart sank. My poor old dog was abused originally and has food aggression; so it took me running to the house, grabbing the treat bag to entice her with something better. It worked but she'd wrecked the nest; treading lightly I found two nestlings. This wren pair had just two in the Spring and I felt like this was probably all the birds. One appeared unharmed, the other had one small puncture to the abdomen and it look like the top layer of skin was torn. My biggest fear was infection. I think in all of 15-20 mins; we flushed the wound with hydrogen peroxide, put the nest back together as best we could, and placed it in a hanging basket above where the nest had been. Then I waited; it took a better part of an hour, but the parents found them and then began feeding them again. I still thought about the wound and debated if we should pack this little one (or both) off to the rehabber? 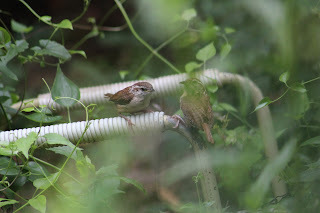 Knowing a bit about the bird, even knowing this particular pair (they had 6 nests last year); I knew them to be a super smart and adaptive bird, and this pair are excellent parents. No rehabber can care for a baby bird like it's parent. So, before dark, I made the decision to clean the wound once more, this time adding triple antibiotic ointment. It already looked better; I added just a bit because I didn't want the feathers coming in to be compromised by the gel, but to create a barrier against the dirty nest. Next morning as I went to check on the chicks, I told myself if it was weak, I would go immediately to the rehabber. To my surprise, both parents were on hand and it took awhile before I could safely check on two very alert birds. They were very close to fledging...so the next concern, were their wings broken by the attack? Days passed, the parents stayed completely attentive and started their calls to encourage the chicks to fledge. Four days later they were gone. Nothing was amiss, it just looked like an empty nest but I wondered, "did they make it?" I found them! Because I know this pair so well, I know where they bring their young. It's right behind our fenced in yard (where the dog can't reach) and is shaded by a pecan tree. Both were still being well tended to by the parents and I could not tell which was the injured one. Each looked full of feathers on their abdomens as best I could tell with a zoom lens. I sighed a relief. For me, its hard to know when to step in or step back. The law is pretty clear and I respect that; and I also feel the pull to become a full fledged rehabber...but I also know the time and financial considerations that come with that choice. If you know nothing of birds and find yourself with what looks like a bird in need, call a rehabber. Many willingly accept text messages and pictures and can advise immediately. For me, I knew a little more than the average person; I have handled pet birds before (I still wore gloves with both wild species). 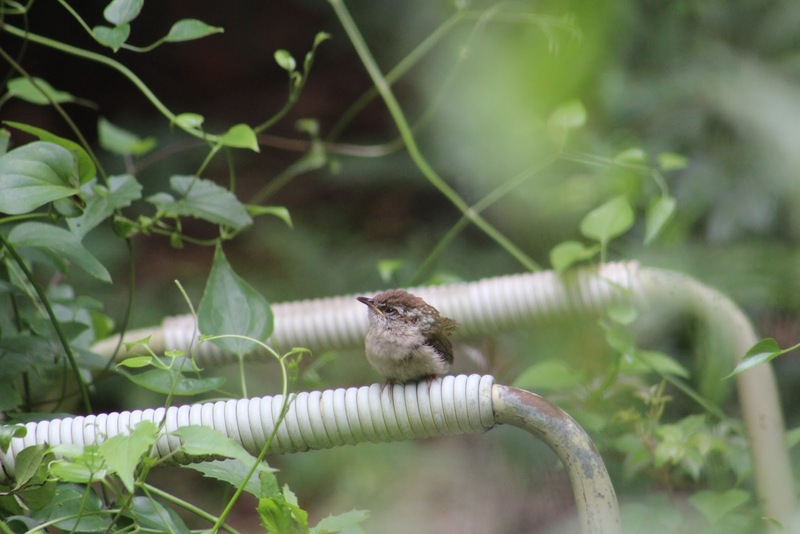 I also knew which bird was more critical to conservation; the chimney swift is in decline, the carolina wren is one of many just in my yard alone. 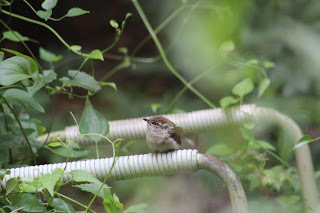 I wanted both to survive individually, but knew it would be a strain on a rehabber to care for the wren and take away resources from other species - and that's why I stepped back to let the parents try. Thankfully, both birds got their second chance.